Sweet caramelized roasted root vegetables team up with a spicy salty miso-harissa dressing to make a salad that’s totally craveable. Yes, I’m a new year’s cliche. But if we’re gonna do this whole healthy happy thing in 2014, then we are gonna do it HARD. 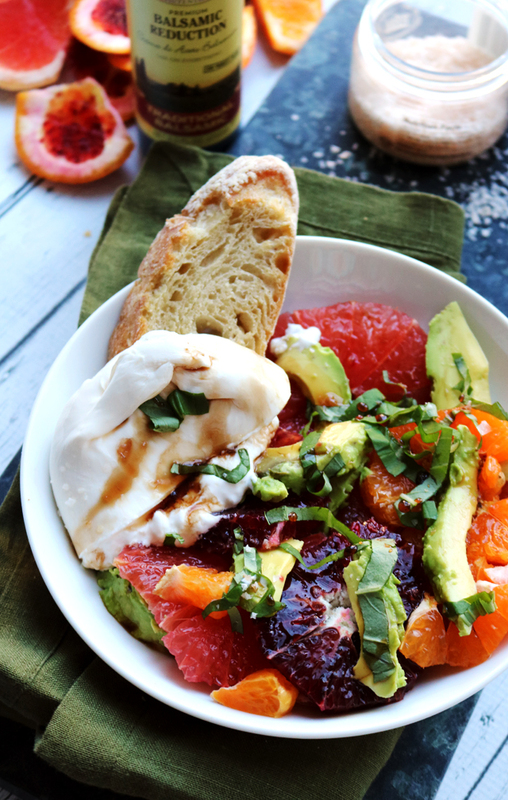 And what better way than to put ALL THE SUPERFOODS in a bowl and call it a salad? I truly can’t imagine. Plus we’re always being told (mostly by Dr.(/not-a-doctor-at-all) Oz) that spicy food speeds up our metabolism (harissa! ), and my container of miso informs me every time I open it that eating it decreases my risk of breast cancer. Speaking of 2014 goals, what’s the dealio? Do we have any? Do we not? Are we clutching our bowls of brown butter close to our hearts lest they be torn away from us by health fanatic goody two shoes?? I have a few goals for the new year, some health-related, some blog-related, some life-related. Health: Everything in moderation, including moderation. Eat dessert once or twice a week, but stop with this every night business. Make a soup or salad (or both!) at least once a week. Really get to the gym/go for a run 5 days a week instead of the two and a half I’ve been averaging this holiday season. 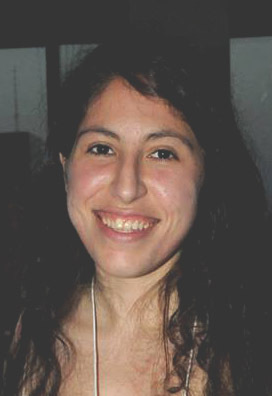 Blog: Be more organized! I think I give off the impression sometimes of having it all together, but I’m often scrambling to meet deadlines, going to bed too late, or cooking in the morning before heading off to work (late). I need to be more vigilant about making a schedule and sticking to it. To this end, I’ve bought this super cute planner that I will hopefully write things in. For more than just the first two weeks in January. Life: Make a grocery budget! And stick to it. Play the piano at least twice a month. Read more books (one a month, at least). So what are you doing to make yourself happy this year? Week 9 of the 12 weeks of winter squash!! 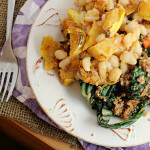 See what other people are cooking up and leave a link if you’ve cooked with winter squash this week! Sweet caramelized roasted root vegetables team up with a spicy salty miso-harissa dressing to make a salad that's totally craveable. Cut the carrots into thin coins. 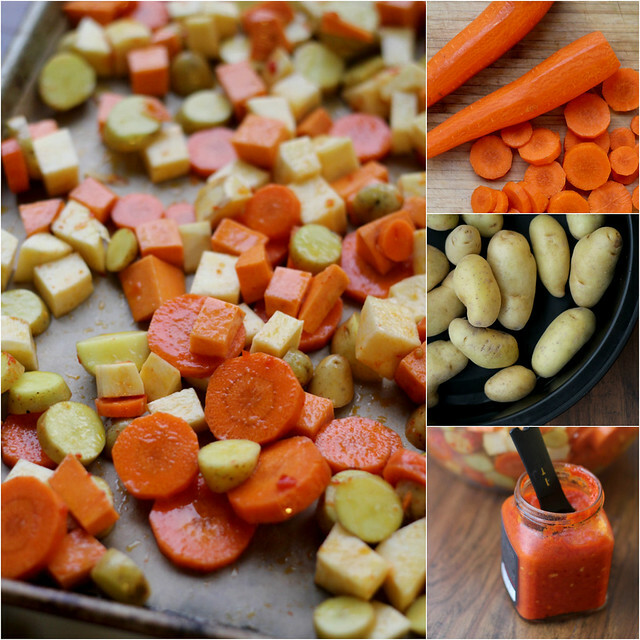 Cut the sweet potatoes into 1-inch dice and the fingerlings into thin coins. Toss the carrots, sweet potatoes, fingerlings, and butternut squash in a large bowl with 1 tbsp of harissa, ¼ cup olive oil, and salt. Spread out onto two parchment-lined baking sheets. Roast until golden and tender, about 45 minutes, tossing once halfway through and rotating the pans. Remove from the oven and let cool slightly. In a separate bowl, whisk together the remaining harissa, miso, lemon juice, and ¼ cup of olive oil. Season to taste with salt. Tear the kale leaves away from their stem, and slice into thin slivers. 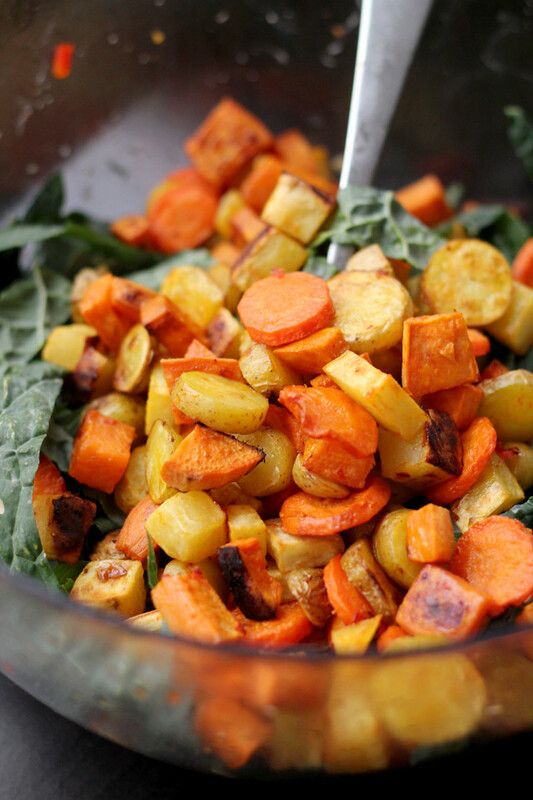 Toss the roasted veggies with the kale and half the dressing. Add more dressing to taste. Serve with the almond slices sprinkled on top. I need to become a new years cliche too! Gah! I just ate a chocolate granola bar for breakfast. So disappointing. Keep the healthiness coming!! I really need to get on the harissa train! It looks so good and I’m seeing it all the time lately. Lovely salad — perfect for starting the new year off right 🙂 Happy 2014!! 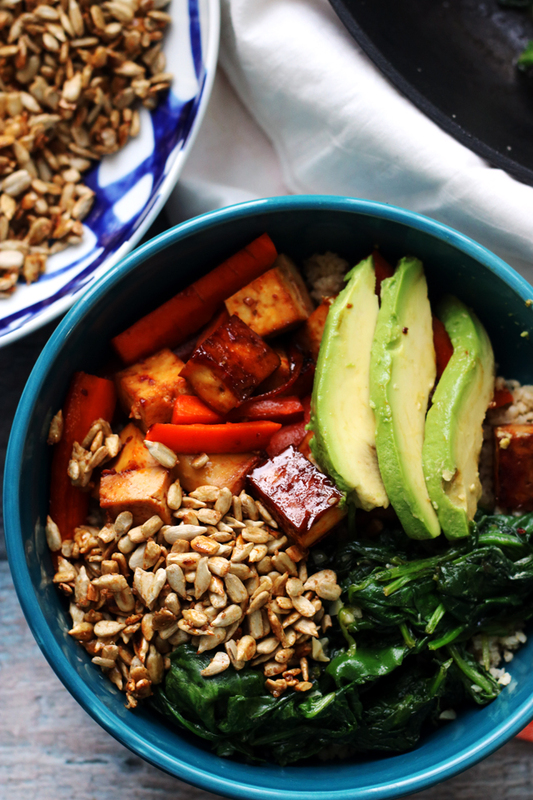 Super foods in a bowl sounds PERFECT right now. That looks so good! I need to get on board with the soups and salads. Lots more veg in my diet! 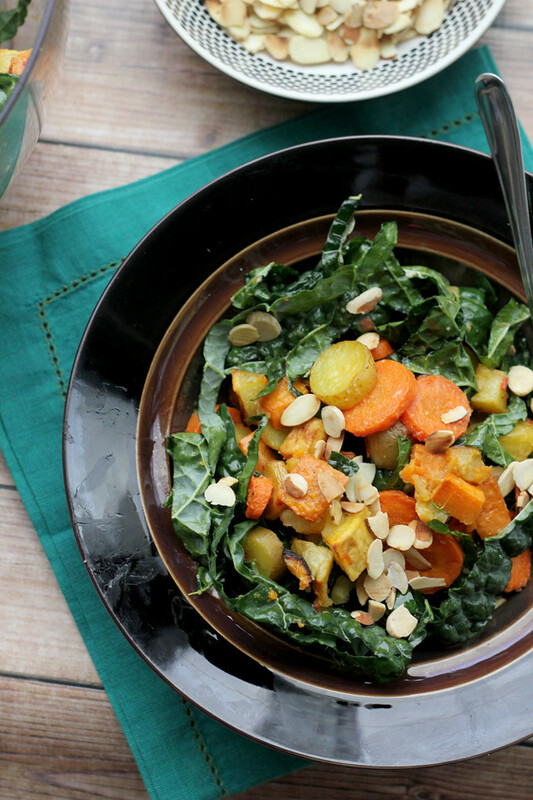 I can’t get enough sweet potatoes and carrots these days – I feel like I’m cooking with them all the time! This salad is right up my alley then 🙂 Love it! What a gorgeous and healthful salad. I definitely need to get back on the salad train after eating what feels like mostly cookies for the past 2 weeks! I love roasting veggies and putting them into a salad – it just adds SO much great flavor. Love this recipe! Love love love the flavours in this! So bright and vivid and full of goodness. I am allllll about the New Year’s cliches! Hello, kale 🙂 This potato salad looks so flavorful and hearty. Can’t wait to try it! This is one beautiful salad! 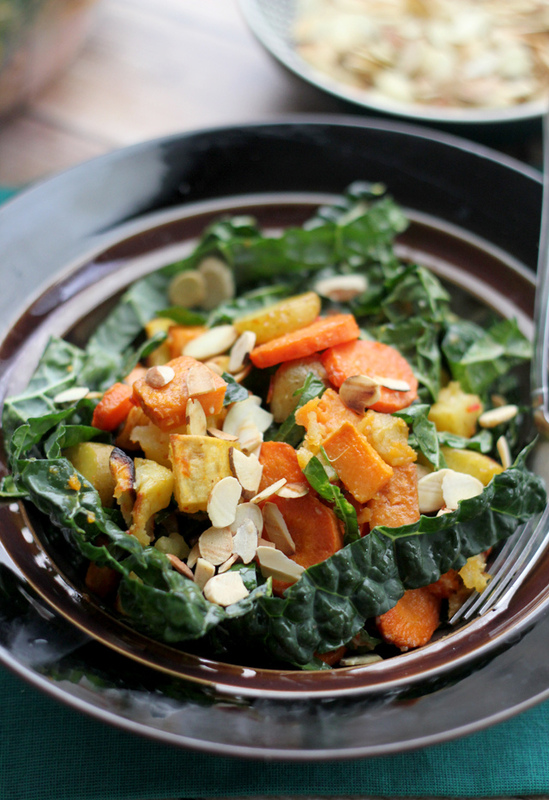 Love the combo of the sweet veggies – potato, squash and carrots with the not so sweet kale and spicy harissa and miso! Your pictures are gorgeous Joanne! And Dr. Oz is not a Doc?!?!?! Technically he is, but he hasn’t actually practiced medicine in years and a lot of what he says is scientifically untrue…he’s definitely more interested in getting famous and making money than he is helping people! Dr OZ is renowned heart surgeon who still does heart surgery on a regular basis at New York Presbyterian Hospital. He would love this recipe. This salad is wonderful! What he’s not a doctor?! 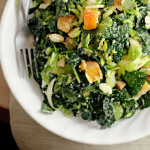 I love salads like these, even when there is no new year’s resolution at stake! The dressing is totally original and I can’t wait to try these flavors together. They’re a perfect match. Definitely going to give this a shot for dinner tonight! Lol. Every time “Dr.” Oz would make an appearance on Oprah (in his scrubs, because, you know, that makes him seem legit), I would think to myself “I’m not really a doctor, but I play one on TV.” This salad is you in a bowl, Joanne. And I love it! 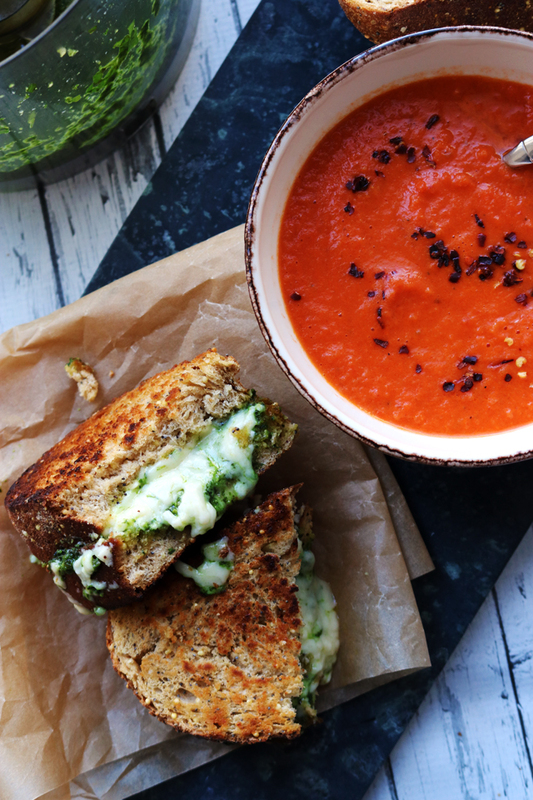 This sounds delish and perfect for the new year’s resolutions! I love roasted vegetables on salad, not to mention some crunch from nuts and just a general warm/hot combo. This looks delicious! Good luck with your goals. I set small ones too…not resolutions or anything dramatic. It’s more an awareness to be better – period. Happy 2014! I am a little afraid to state this in the open, but I am finally feeling happy with myself and the goals I set years ago. I don’t have resolutions this year. Just keep doing what I’m doing. I really love your winter squash recipes. The bright orange always makes my day. I didn’t know that miso was so good for you, must buy asap! This looks delicious. I haven’t made official resolutions but am starting to think about a few I should put on my list… I like your moderation goal! You make healthy food so inviting and moreish! 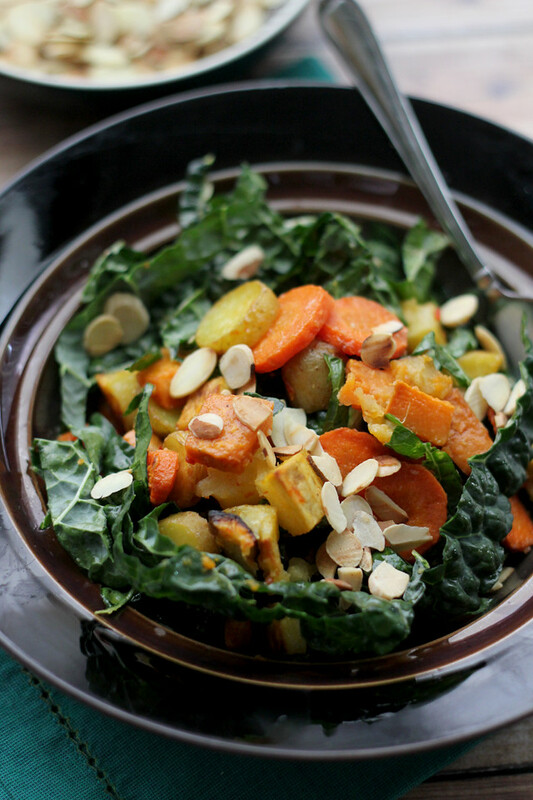 A simple dish of spicy roasted veg sounds exactly right for the first week of the new year. Especially in salad form! Hooray! Love the idea of doing a grocery budget, I need to do that too, as well as start planning per week or bi-week, would make buying alot easier and less spur of a moment (which gets more expensive!). No one will take the brown butter away from me. NEVER! I have a few goals for myself this year. In fact, I feel like your list could be mine. One of my goals is to get into work early every day. I tend to work on my blog in the morning before work and I ALWAYS make it to work 10-15 minutes late. And I need to work on my grocery budget. I used to budget really well for groceries, but lately, not so much. That is such a perfect winter salad. I wish I had that for dinner tonight so I have no idea what we are having yet! Besides playing the piano, we have really similar goals! Of course, I did take piano lessons for 6 years, so maybe I should add that one to the list and re-teach myself to play. The grocery budget is so hard! We all beat ourselves up for over-indulging during the holidays but, for those if us who really care about our health, it’s not hard to get back to healthy eating when our jeans start feeling a little tight. And then we have you to inspire us :). This looks healthy and delicious. I really need to start eating healthier this year, you are a great inspiration for that. This looks absolutely delicious and very much-needed after my New Year’s Eve! Love all the health benefits and goodies in this salad. I’ve never used miso before, so I’m psyched to try this out! This looks really good! 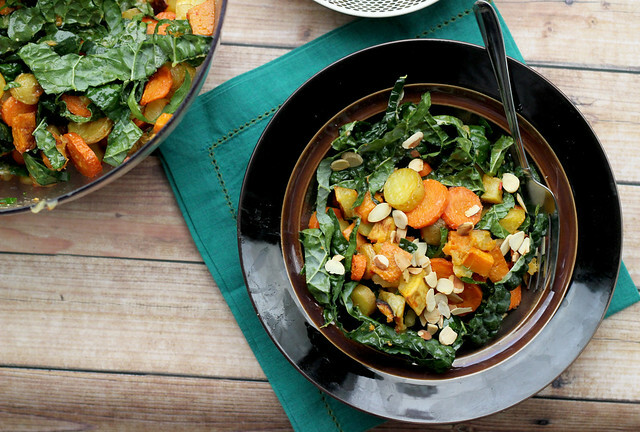 I love almost everything about this salad especially the roasted veggies. Kale is my favorite leafy green but I’m really not abig fan of eating it raw. So what I would do is douse it with olive oil, salt, pepper and just roast it as well. All the super foods! So much goodness here. I’m trying to eat especially clean and healthy in January and this salad looks like the perfect place to start. Thanks for sharing Joanne! This is a super salad and a great way to start the year. Love your goals. especially getting more organized on the blog front. I need to stop staying up late (cough 12.10am right now) and stop going to lab at 10am everyday. Oh and read a book that is not a food magazine, journal article or vogue at least once a month! What are Miso, white Miso and Harisso/ Harissa ? Thanks. A Veggie, a Spice, Asian Veggie, Asian Spice ? Miso and Harissa! Nicely done. I love crossing things off the list too. This looks superb! A beautiful salad to detox from all the meat I had these past few days! I wish to you and your family a Very Happy and Prosperous New Year full of love and good health Joanne! I love your goals, and I definitely love this dish. Delicious and health / life boosting all in one! I love the combination of miso and harissa together. I can almost taste how amazing this salad is through my computer screen! Happy Friday! This salad looks beautiful! Something great for us all trying to detox the holidays! I’m new to your blog and not only pinning this but subscribing; it’s so beautiful! Sounds really good! Never used a miso salad dressing before, but its time to try some, right? Looking forward to trying new recipes this year! Happy New Year Joanne!! I want to incorporate more vegetables into my life! I’ve kind of been bad about that and I’m craving them like crazy. This salad is screaming my name! Loving all those roasted vegetables. I just ordered a planner last night too! It’s the one by Whitney English that everyone’s been talking about. With all the cooties in my house the last few weeks, I’ve fallen off of the 12 Weeks of Winter Squash bandwagon, but fear not! I bought lots-o-squash at Mrs. Green’s yesterday 🙂 This salad looks like an awesome way to pack in lots and lots of veggies. Beautiful! 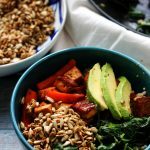 I adore roasted veggies – this is my kind of salad! Such a gorgeous, colorful salad–I feel I just got healthier by looking at it! 😉 Yum! Beautiful, as always. 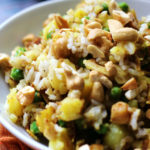 Another must try from you kitchen. 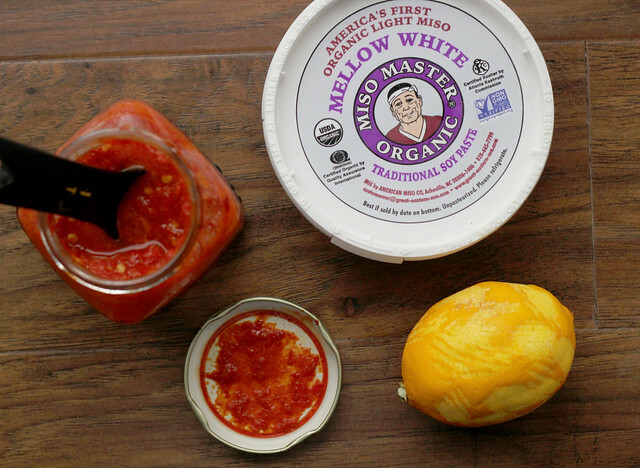 Harissa and Miso together – sounds like a formula that even Dr Oz can’t beat! 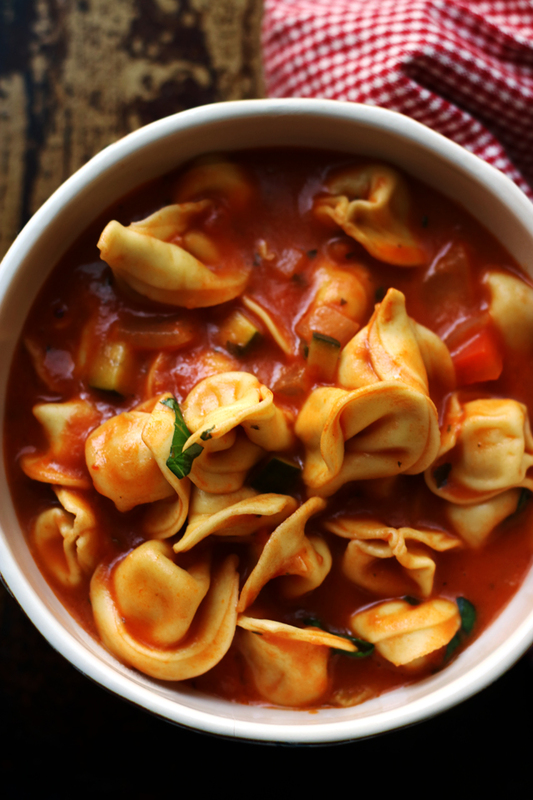 Thanks for adapting my recipe so beautifully! What an honor to see it here. I’m loving all your recipes and looking forward to trying them and reading more. Cheers. This salad is off the hook, yum!!! So much flavor in this bowl 🙂 I love it!